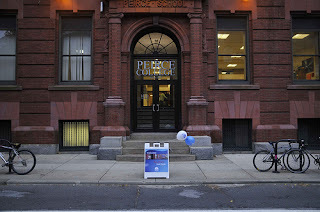 The Peirce College alumni open house on November 19 was very well attended. It was great to host so many graduates and hear about their Peirce and life experiences. Although we communicate with alumni on a regular basis (including through our newsletter, Peirce Perspectives), there is nothing better than getting together face-to-face to fortify our relationships and share our Peirce pride. Fortunately, pictures were taken that captured the essence of the evening, which you can view in a slideshow below. Peirce has a diverse group of alumni that represent the College extremely well in the workplace and the community. It was particularly exciting to have Virginia Hurff Gilbert '33 (pictured with me to the right) and Enus Shupp '35 attend and actively participate. Peirce has a long, great history and these two individuals personify the Peirce College spirit and drive. Every decade, from the 1930s through the 2000s, was represented at the event. Everyone, regardless of graduation year, demonstrated great enthusiasm for the College. While Peirce alumni live all over the country and world, by and large, our studies show that 75 percent tend to stay in the Philadelphia area after graduation. 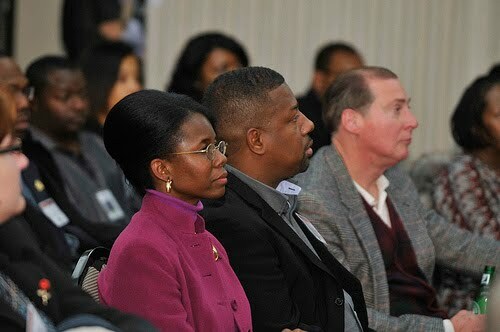 Those in attendance really cherished the time they spent at Peirce. Yearbooks and photos were displayed that sparked fond memories about their college days. It wasn't uncommon to see emotions surface when former classmates recognized each other. Many spoke of how their time at Peirce helped them in both their personal and professional lives. Best of all, our alumni demonstrated that they are an engaged group with a desire for even more participation in the new era. They gave meaningful insight into a number of topics, which indicated how well they understand the value in our approach, and who our students are. Most notably, they expressed appreciation for how we mix the traditional, classroom-based model with online course delivery. They also shared some constructive criticism. They suggested broadening our reach to include more traditional-aged students (18-24), in addition to working adults, and a desire for Peirce College to engage its alumni on a more consistent basis. They also commented on the importance of strengthening relationships with business and community leaders, offering expanded career services, and increasing recognition for the Peirce College name. Feedback and insight from our alumni is invaluable, and they will continue to be a major part of Peirce College in the new era. Based on their feedback, more alumni-centered activities will be held in the future. Thanks again to all the alumni and guests that attended the open house, as well as to the staff and faculty that helped make it a great night! To view a slide show of the pictures taken at the open house, click on the photo below.